Yesterday was fun. Columbia River Fire and Rescue invited our department to go play at their new training facility. It's actually not yet complete, but what's there is incredible. Unfortunately I didn't bring a camera, maybe next time. Nine of us got there around 9am and started with a tour. Around 10ish we donned our turnouts and the play began. Our time centered around 4 propane fired props meant to simulate attacking fires on natural gas or propane devices. The first one was a pipe coming out of the ground with a couple of shutoff valves and a pressure relief valve. Up against it was a conventional cab that had rammed into it breeching the pipe and causing ignition. There was also a mannequin down, the driver who knocked himself out while attempting to abandon the burning vehicle. For this drill, and the others, we attacked in teams of 5, two nozzle teams advancing with wide fog patterns to form a protective shield and the leader who was to shut off the valves and thus kill the fire. The nozzle teams were to refrain from extinguishing the fire so as to avoid unburned natural gas venting. We attacked this prop a few times, rotating the roles each person played. The next prop simulated an industrial gas meter which had been breached, the flow of gas was ignited (it takes flame to keep the attention of a bunch of fire-fighters). We attacked this in much the same way as the previous prop with similar results though here the burn was hotter and tended to come back at us more aggressively. The next prop was a propane tank, similar to hundreds found in our district, we added an initial phase to our attack, cooling the tank before approaching it. Otherwise the drill was getting familiar and we were starting to work more cohesively. After a couple of attacks on this third prop we moved the the special pizza box prop, several were consumed, and everyone was feeling lethargic at the end of this test. We then did a few more attacks on the propane tank and moved on. The last prop we got to play with simulated a leak from a storage tank. This was the coolest one because the leader now had a third hose to work with and using the water to push the fire away from the shutoff valve was much more interesting. I shagged hoses for the first 3 evolutions, for the last one I played officer. It was a lot of fun. I think the take-away is that you need to position your crews as close to the fire as you can safely do so their water pressure is as effective as possible in pushing the flame away. The return trip was uneventfull. I had barely made it home when my pager went off. It was around 5:45 so my first though was tone-test is early. Still I bounded to the livingroom where my pager makes its home and found out that this was not our tone-test, it was an MVA resulting in a motorcyclist at the bottom of a 25 foot embankment. I dashed out to my car and flew to the main. The AC and I waited for a couple more responders in the medic. Several people had other commitments so I ended up driving the medic into Hillsboro (patient choses our destination if s/he is able). By the time we were back at the main it was 10:30pm. I was bushed, we refuled and restocked the medic, did our paperwork and vanished. I actually turned off my pager when I got home. I know it is a bit early for this, but I need help. Four trees have announced their candidacy for Christmas tree 2007. 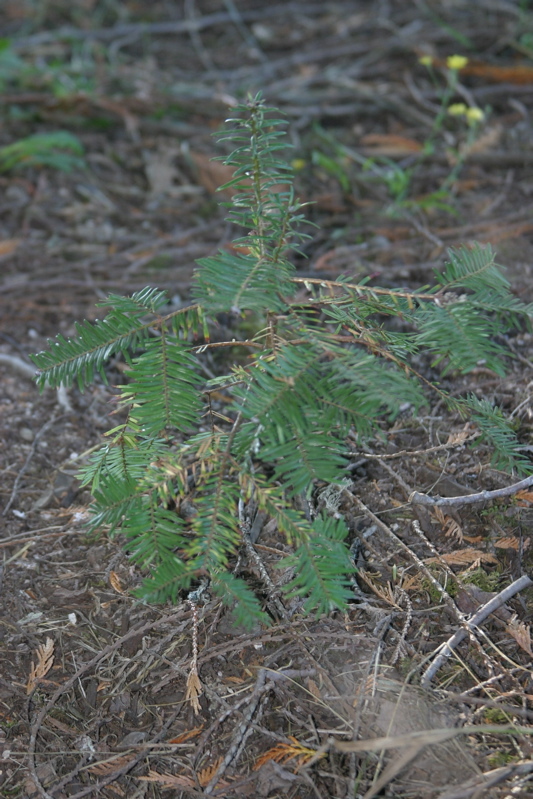 Since the winner will serve a 3 or 4 year term it is critical that the tree be picked carefully. 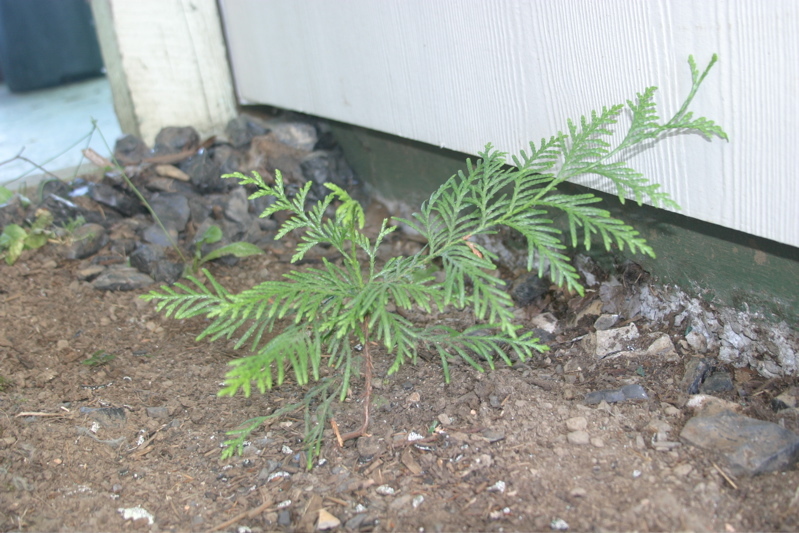 Tree 1 is a little cedar who's opted to grow right next to the house. He's now almost 2 years old. 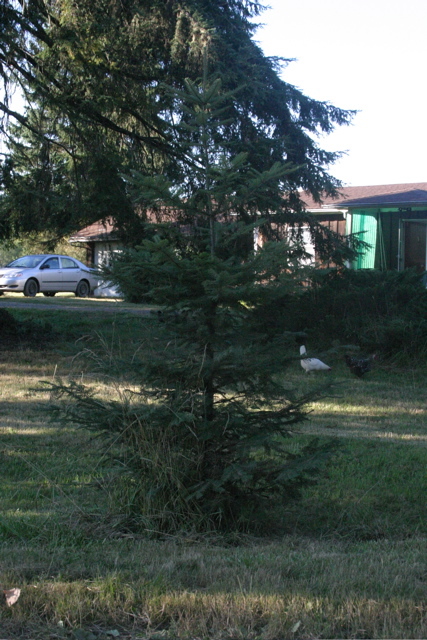 Tree 2 is a little cedar who's also opted to grow right next to the house. He's now almost 1 year old. 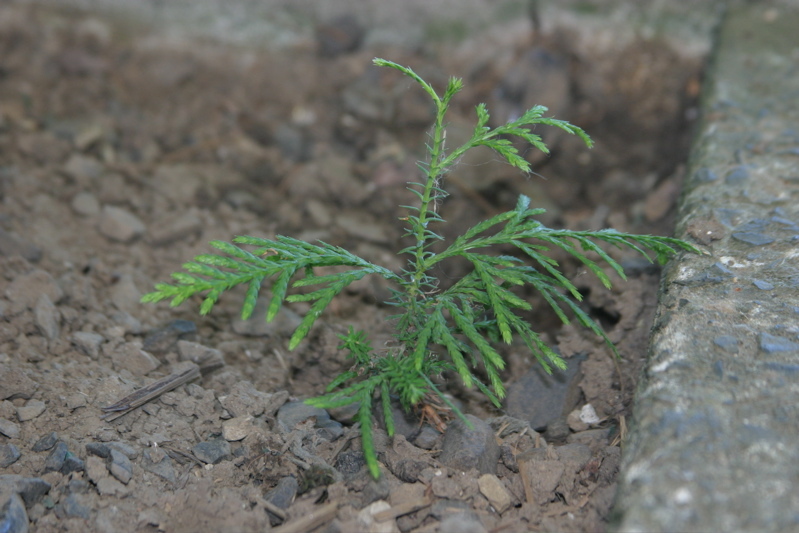 Tree 3 is a little fir who's opted to grow right under one of the cedars at the end of the driveway, he's almost 2 years old. 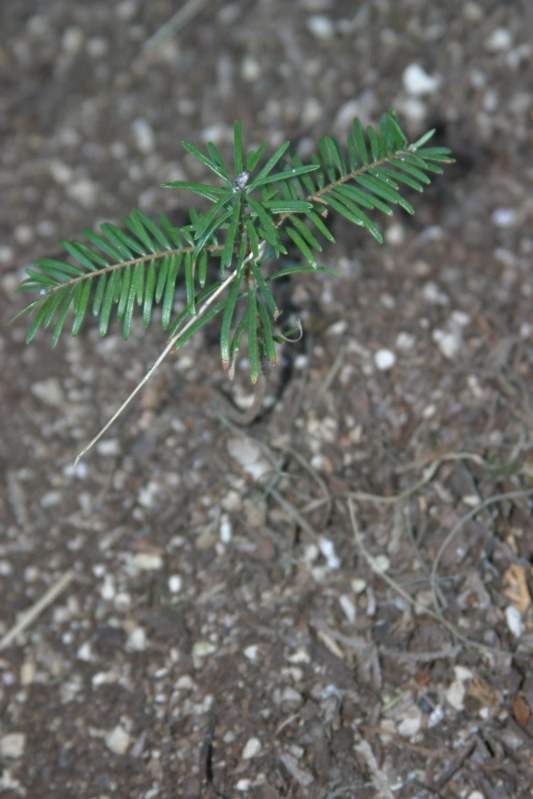 Tree 4 is a little fir who's opted to grow a couple of feet awa from Tree 3. He's almost 1 year old. Who's willing to help with the selection process? The little guy will also need a name, his predecessors were Joseph & Albert. The other day the cats brought me bird for breakfast, unfortunately they left feathers all over the place while preparing it for me. As usual my trusty vacuum cleaner came out to clean up after them. As usual I first picked up their toy mice before vacuuming, also as usual, I put them in my pocket. A moment ago I decided to return their mice to them, unfortunately two of the toy mice were not toys, but had probably been meant as an appetizer for the main course (bird). Yuck.